Mumbai 08 August 2013: TONI&GUY HairMeetWardrobe, Britain’s most celebrated hair-styling brand, today made a resounding foray into the Indian market, bringing with it a gamut of its most distinguished global products. Dominating the twin worlds of high fashion and hair styling, TONI&GUY HairMeetWardrobe coherently defines everything that lies in between. The debut launch emphasises the brand’s philosophy of ‘HairMeetWardrobe’, showcasing the revolutionary concept of how hair can be worn as an accessory. The much anticipated India launch witnessed an avant-garde evening with an enthralling musical performance, witnessed by the crème-de-la-crème of the fashion and film fraternity. TONI&GUY’s HairMeetWardrobe Global Hair Ambassador Mark Hampton and official fashion stylist Manish Arora together brought to life the brand’s HairMeetWardrobe philosophy by lending their creative sensibilities to hair styling and wardrobe, respectively. Themed on the concept of ‘HairMeetWardrobe,’ and the three timeless looks – Casual, Classic and Glamour – ace choreographer Shiamak Dhawar, beautifully brought to life the brand’s philosophy through a themed musical performance. At the musical, Anusha, Soha and Malaika performed as showstoppers for their respective themes. Three Indian fashionistas – the glamorous Malaika Arora Khan, classic beauty Soha Ali Khan and casual yet chic Anusha Dandekar walked the red carpet in three timeless looks curated by Mark Hampton, TONI&GUY’s HairMeetWardrobe Global Hair Ambassador. Each of these divas embodied the theme of a chic TONI&GUY HairMeetWardrobe range, namely – Glamour, Classic and Casual. Mark Hampton enhanced Malaika Arora Khan’s glamorous look by emphasizing her TONI&GUY HairMeetWardrobe Glamour beautiful long tresses into a high-glamour beautiful long tresses into a high-glamour waves. A Moisturizing Shine Spray from the collection was used to give her hair a weightless collection was used to give her hair a weightless dress’ shine. Malaika, who embodied TONI&GUY HairMeetWardrobe Glamour variant looked ravishing in Manish Arora’s ‘Glam black baroque. Mark Hampton leveraged Soha Ali Khan’s sophisticated aura and emphasized her classic Indian beauty by giving her vintage sideswept waves. Mark used TONI&GUY HairMeetWardrobe Shine-gloss serum, a light weight formula, from the Classic collection to weight formula to seal her flawless look. Soha, who embodied the TONI&GUY HairMeetWardrobe Classic variant, looked gorgeous in Manish Arora’s ‘scarlet princess dress. To celebrate TONI&GUY HairMeetWardrobe’s India launch, celebrities like Shamita Shetty, Anil Chopra, Preeti Jhangiani, Apurva Agnihotri, Shweta Salve, Narayani Shastri, Rahul Vaidya; Designers Aki Narula, Swapnil Shinde; Models Priya Trivedi, Carol Gracious amongst many others were in full attendance at the musical extravaganza. 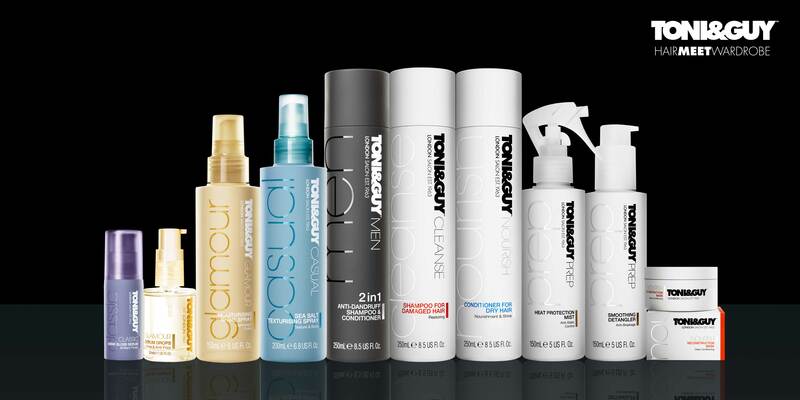 TONI&GUY HairMeetWardrobe launched six vivid ranges from its global portfolio: Cleanse and Nourish, Prep and Men’s Classic; and timeless collections inspired by fashion Casual, Collection and Glamour Collection.